Dushenka Silberfarb will be sharing the secrets of coping with holiday entertaining. How do you deal with multiple guests who all have differing food restrictions? What do you say when they insist on bringing their own food? How do you get through it all not only with sanity intact, but also with graciousness? 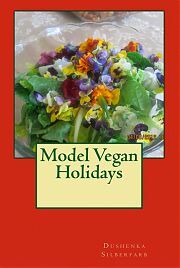 Dushenka will illustrate with recipes from her newest book, Model Vegan Holidays. 3:00 pm on November 24 at 30-A Hollis Street in Groton.